There are many foreign nationals around the world that find themselves as criminally inadmissible to Canada. If this is the case for you, you are highly recommended to research and understand what you can do to overcome your criminal inadmissibility. It is indeed a very unpleasant outcome if you are denied or refused entry into Canada. As such, the best options to attempt to overcome your criminal inadmissibility to Canada are to either apply for a Temporary Resident Permit or a Criminal Rehabilitation. In this blog, you will learn about common questions that individuals have about criminality in Canada. Many Immigration officers will ask you if you have a criminal record at the border if you are entering Canada through a Canadian border or port of entry. There is a slight chance that immigration may not ask at all. If they do, however, they will be able to search your criminal record on their data base. This is especially the case if you are a United States citizen or a green card holder. Honesty is the best policy. If you do have a criminal record, it is best to be honest with the Immigration officer. If you intend to lie or provide false information, you may be accused of misrepresentation. 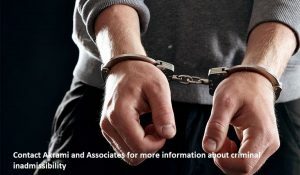 Criminality, which is also known as , can result from having a criminal record in any country in the world. For instance, a foreign national can be convicted of fraud in their country of origin or country of residence, and this criminal offence will lead to criminality, or criminal inadmissibility, in Canada. The most common conviction that many foreign nationals have, specifically from the United States, is driving under the influence. Even though each state has different laws and regulations for driving under the influence, what matters the most is the offence’s equivalent in Canada That being said, even if your driving under the influence offence was just a misdemeanor in the USA, it could still make you inadmissible to Canada. A lot of individuals think that if their offence was old enough, they would have no problem entering Canada. This can be both correct and false. You may have heard of a concept in Canadian immigration law called “deemed rehabilitation.” Deemed rehabilitation means that an individual is no longer inadmissible, because ten years or more have passed since the completion of the sentences. Unfortunately, having elapsed the ten years does not automatically make you admissible to Canada; it still depends on the severity of your offence. If your criminality is serious, meaning it has the potential to be punished by at least 10 years of incarceration according to Canadian law, you will never be deemed rehabilitated. This also applies to cases where an individual has two or more offences on record. Secondly, your admissibility is at the discretion of the immigration officer. If the officer finds that you are still a threat to Canadian citizens and permanent residents, then you can still be denied entry, even if you have met the conditions for deemed rehabilitation. On the other hand, some officers, who are not unfamiliar with the concept of deemed rehabilitation and its application, can also deny your entry to Canada. This entirely depends on whether the pardon or expungement can be recognized in Canada. If your country of origin or country of residence’s legal system is similar to Canada’s, then it is very likely that your criminal offence will also be recognized as pardoned or expunged in Canada. On the contrary, if your country of origin or country of residence’s legal system is different than the Canadian legal system, then it is very likely that your criminal offence will not be recognized as pardoned or expunged in Canada. Pardons, record suspensions, or expungement is indeed a tricky question; therefore, it is highly recommended that you seek professional guidance to find out whether or not your offence is pardoned in Canada, before you attempt to enter or travel to Canada. Should you have any further questions or feel unclear about your criminal inadmissibility or your criminality in Canada, it is best to talk about, ask any questions you may have and discuss your concerns to an immigration professional prior to travelling to Canada. By discussing your inadmissibility to an immigration professional, this will ease your worries and assist with the application process. Many immigration applications are difficult to pursue on your own and it is highly recommended that you seek out professional and experienced help before attempting to apply. Here, at Akrami & Associates, we work and have experience with many different immigration issues. We have helped many of our clients overcome their criminal inadmissibility and their criminality in Canada by applying for the appropriate application for their specific circumstances, whether it be a Temporary Resident Permit or a Criminal Rehabilitation. If you believe that you may be eligible to apply, please feel free to contact Akrami & Associates at our office at 416-477-2545 for more information or if you would like to book a consultation with an immigration professional for more advice. With Akrami & Associates, there is always a way!